This happened almost 3 years ago but it is one of my favorite stories ever. I used to work at a little grocery store in my hometown. It was aptly called The Tiny Store and was a good time. Very laid back. Canonsburg is a relatively small town and with any small town, it is full of some fine people. So anyways, the female half of the shady couple comes in to cash her boyfriends check. I know that her boyfriend is in jail and forever banned, but I wasn’t really sure about her status and kind of didn’t care. We make sure her check clears, it was only 27$ and Brandy goes to cash it whilst I ring up another customer. Now I drew a picture to give you a better feel for what happened next. After cashing her check, I was ringing up this kids debit thing and so my back was turned for a whole 24 seconds. Oh another bit of info, underneath that drawer was a cupboard, in the cupboard was a box with 200$ worth of change. When we needed change for our register, we’d take the change out of the box, and put the money for it in an envelope in the drawer. Now pretty much anyone could have known it was there, we were never sneaky about it. But in my five years, there was never a problem. There could be close to 200$ in the envelope, all dependent upon when it was last settled. 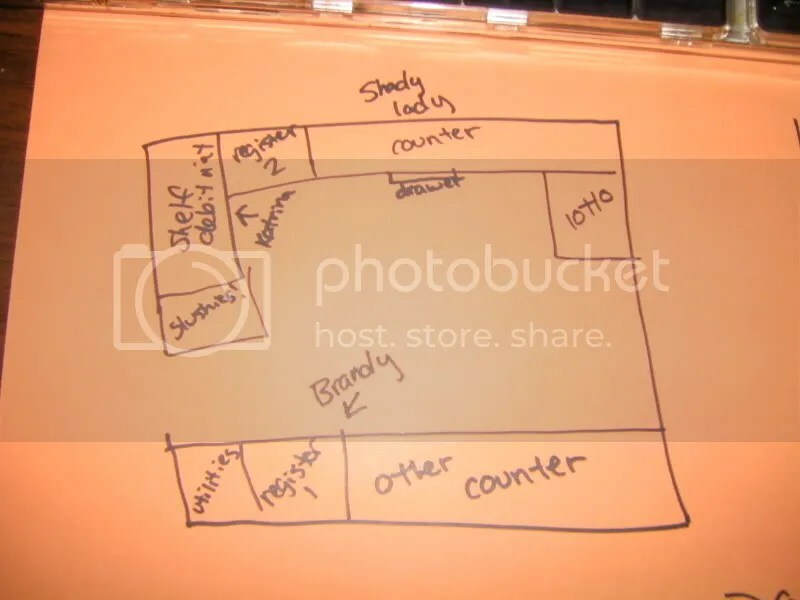 So Brandy was over on the other side, I’m at the debit thing, and when I turn back around, Brandy is already back at my counter, and the drawer is open a little bit. I figured Brandy just did something. And then I realized that didn’t make any sense. So the lady walks to the right around the counters and is asking Brandy for cigarettes. And the lady is out the door. Mike runs up and I tell him “That lady just took the envelope!” He goes out the door after her. And oh this isn’t even the best part. So he’s gone for like 15 minutes, I’m shaking from the adreneline rush. Comes back with the cops, Shady Lady in the backseat. I count the change, she only took 37$. But the best part is what transpired after Mike got out the door. So Mike knows she went this way. He sees a guy and asks him if he saw the lady. He said he did and that she was shoving something in her underwear. Delighted, I’m sure, Mike continues toward her apartment. He finally spots her in the middle of the street and yells for her to stop and give him the money back or the cops will be knocking on her door. “I don’t got any money, I don’t got any!” she shrieks waving her arms all around. I don’t know what Mike said next but it prompted her to lift up her dress, flashing all of the world and drop her underwear. And then Mike saw the money. Sticking out…of exactly where you think it was. So, uh, wanna know the price for a body cavity search? Apparently 37$.